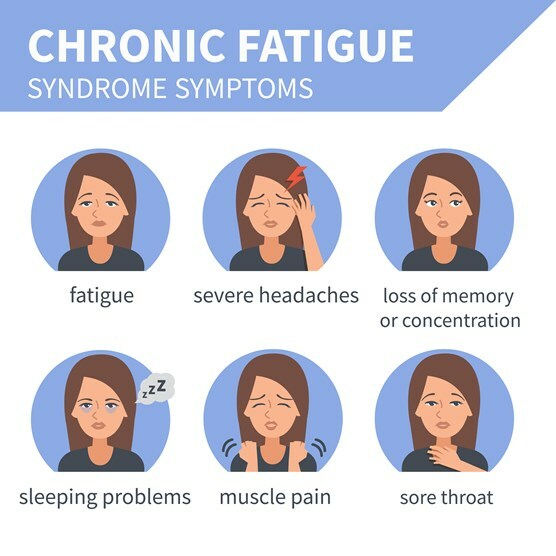 Chronic Fatigue Syndrome (CFS) is a multi-factorial, challenging condition with many possible underlying causes and contributory factors. Chronic Fatigue Syndrome (CFS) is often referred to as myalgic encephalomyelitis (ME). There is some debate over the correct terminology, however, both are debilitating long-term conditions that can severely impact day-to-day life. CFS can affect anyone, but is more common in women, and is most likely to develop between mid-20’s and mid-40’s. Stress and high-intensity exercise can make symptoms worse, and severity of symptoms can vary from day to day. CFS is usually a symptom-based diagnosis, however, there are a number of functional tests that can be run to help identify issues that may be driving the condition. Testing to identify nutritional status can reveal any vitamin and mineral deficiencies that may be affecting energy production. These tests can also expose potential microbiome imbalances and intestinal permeability (leaky gut) that may cause malabsorption or blood sugar imbalances, which can affect energy levels. Testing the adrenal function can detect any imbalances of DHEA and cortisol, which can affect circadian rhythm. An imbalance of these hormones can affect sleep patterns, energy levels and emotional state. Underlying viral infections (such as Epstein-Barr, CMV and Herpes), as well as heavy metal toxicity can impact the body’s ability to detoxify effectively and can affect energy levels. At The London Clinic of Nutrition, our aim is to identify the root cause of the problem in order to successfully target and rebalance the body’s systems. At the Clinic, we will support you to improve your nutritional status through dietary and supplement recommendations, and to help you find balance in your life with stress-reduction techniques and lifestyle suggestions. After a stint of bad health and a long run on antibiotics I felt very nauseous, faint and a general lack of energy. After Doctors diagnosed me as healthy I sought the advice of a Nutritionist to get back up to speed. My session with Oliver Barnett was very interesting and informative and he told me how to build on my existing healthy diet, broadening what I ate and how I prepared it, and prescribed a course of herbs and a detox. Within a week I felt a huge change in my energy levels, concentration, complexion and temperament. I’ve stuck to his diet changes and advice and I really feel the benefits.